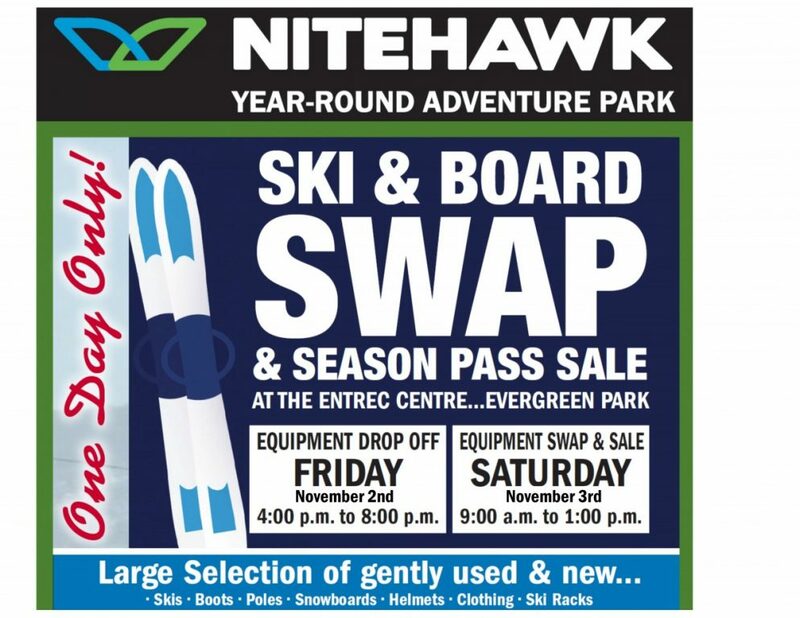 The Annual Nitehawk Ski & Board Swap is an awesome opportunity to get great deals on new or gently used ski & snowboard equipment or even sell your equipment from last year. Note: you can also purchase Season Passes online at www.gonitehawk.com or at Ernies Sports Experts in town. So get up early and be prepared to find some great deals for the whole family! *Please note that the cheques for sold equipment, as well as unsold equipment left over will be available for pick-up at the Evergreen Park ENTREC Centre following the swap at 5:00pm (no earlier) on Saturday Nov.3. *Any unsold equipment that is not picked up by 6:00pm on Nov.3, will be disposed of as the Grande Prairie Ski Club see’s fit. For more details call 780-532-6637 or email events@gonitehawk.com or johnathan@gonitehawk.com.